Cole's room was inspired by the vintage airline posters we found on art.com. We then selected the fabric used in the bedding to coordinate. The bedding was custom made by elleandmel.com. The luscious striped silk fabric features chocolate brown, ice blue, cream, and gold. For the walls, we selected Sherwin Williams "Breezy". It is a muted gray/blue color that we pulled from the background of one of the posters using the Sherwin Williams Color Visualizer tool. 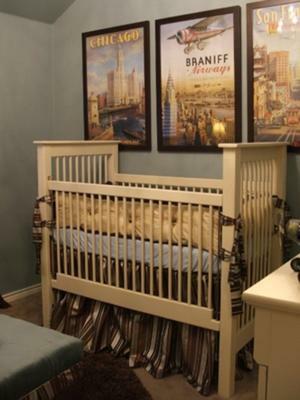 The crib was hand-made by my husband and father, and was based on a very expensive crib I saw at a high-end baby store. They copied it exactly, and it has been used by all three of our children. It will be a family heirloom for generations. 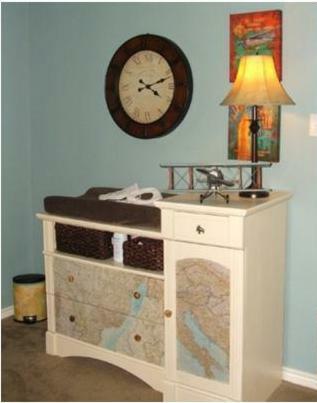 The changing table was a thrift store find that was painted cream to match the crib and decoupaged with maps on the drawer and cabinet fronts. It was custom made by Peekaboo Design Group in Dallas, TX. Peekaboo also stacked vintage suitcases to create the sidetable. The lamps, clock, glider, rug, and other accessories and artwork were chosen to complement the color scheme. We had chosen to keep baby's gender a secret, and worked with Peekaboo Design Group to design both a boy and a girl nursery. Our Dr. sent them a confidential note to let them know what we were going to have, and they completed the nursery behind locked doors while my husband and I were away from home. 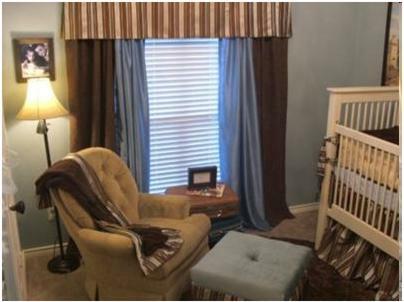 We did not see the nursery until we brought Cole home from the hospital. It was a very sweet way to keep our baby's gender a surprise without having to settle for a gender neutral nursery. Cole's room is so beautiful and relaxing that I do not even mind getting up in the middle of the night with him. It is such a comfortable space for us to spend our bonding moments. 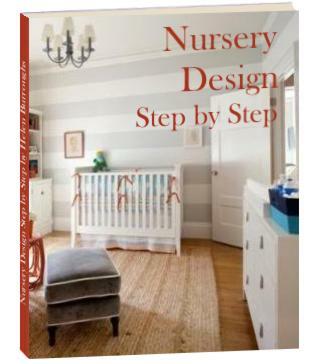 The nursery is beautiful - I love the colors and especially the way you have done the changing table - brilliant!